Not one, but both female North American river otters at Oakland Zoo are new moms to a combined litter of six pups now on exhibit for public viewing. Not one, but both female North American river otters at Oakland Zoo are new moms to a combined litter of six pups now on exhibit for public viewing. Six pups, two moms and one dad bring the Zoo’s number of otters to a total of nine. The moms, Rose and Ginger, are also mother and daughter (Rose is also daughter of Ginger), so this Mother’s Day is a multi-generational celebration for the otters. Rose, the younger of the two moms at four years old, is a first-time mother and thriving in her new maternal role. She gave birth on January 25, 2016 to three pups – two males (Eno and Sikwa) and one female (Kai). Rose’s counterpart, Ginger, is nine years old and a fourth-time mom whose pups were born just a few weeks later on February 20, 2016. Ginger’s litter consists of two females (Ashkii and Sudali) and one male (Victor). The father of both litters is also the Zoo’s only adult male, named Wyatt, who relocated to Oakland two years ago from the Abilene Zoo in Texas, where he was given a breeding recommendation by the Association of Zoos and Aquariums (AZA). Wyatt has been a great father to his pups and has been playing and frolicking carefully with those that have ventured into the water thus far. “Rose is actually Ginger’s daughter and she helped raise her younger brothers (who now live at the Aquarium of the Bay! ), so it’s no surprise that she has been a great mom! In fact, I think she’s excited to get to have her very own pups this time! AZA’s Otter SSP (Species Survival Plan) was very happy to hear that we have two litters. North American river otters are in high demand in zoos and Oakland Zoo’s breeding success means that these charismatic little guys will eventually get to charm even more children in other zoos across the country.” – Margaret Rousser, ZooLogical Manager, Oakland Zoo. **Media Advisory: On Wednesday, May 4, 2013, from 11am – 12:30pm, baby otter photo and video opportunities will be available to the press. A zookeeper will also be present for interviews. Please contact Erin Harrison, Senior Manager, Marketing/Public Relations at (510) 632-9525, ext. 135 or email eharrison(at)oaklandzoo.org if you plan on attending. Press should meet in the lower entrance of the Zoo at Green Gate. 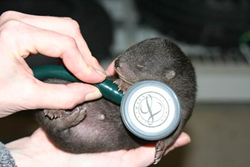 ZooKeepers have been tracking the baby otters’ growth and health with weekly checkups, referred to as "pupdates" to Zoo staff. For the past few months, Ginger’s pups have been off exhibit to nurse and grow – with Rose’s slightly older pups only very recently venturing into the exhibit to take a swim with mom and dad. Swimming is not instinctual; therefore, pups do not go on exhibit until they are strong enough swimmers and a certain size. Zoo guests are now able to watch the new pups in their exhibit daily. The River Otter exhibit is located in the Wayne and Gladys Valley Children's Zoo. River otters actually spend two-thirds of their time on land, yet eat mostly fish, crayfish, frogs, turtles, and other aquatic invertebrates. Otters breed in late winter to spring but the embryos only develop to the blastocyst stage and then they stop developing further until about 9-10 months later. Once they start to develop again, gestation is 68-74 days. This type of process is known as delayed implantation. The pups will start their life in a burrow in a river bank and are born blind and helpless. They are nursed by mom otter for one month and are weaned at about 3-4 months; they then begin to venture out of the burrow/den to play and learn how to swim.